5 Bold Claims For Convergence! Leia - Boushh isn't that strong. Let’s see if we can keep our perfect record going here. Just as a quick reminder on how I do these: I have made all these predictions based solely on looking at the cards and I am actually yet to play or watch a single game of Convergence. 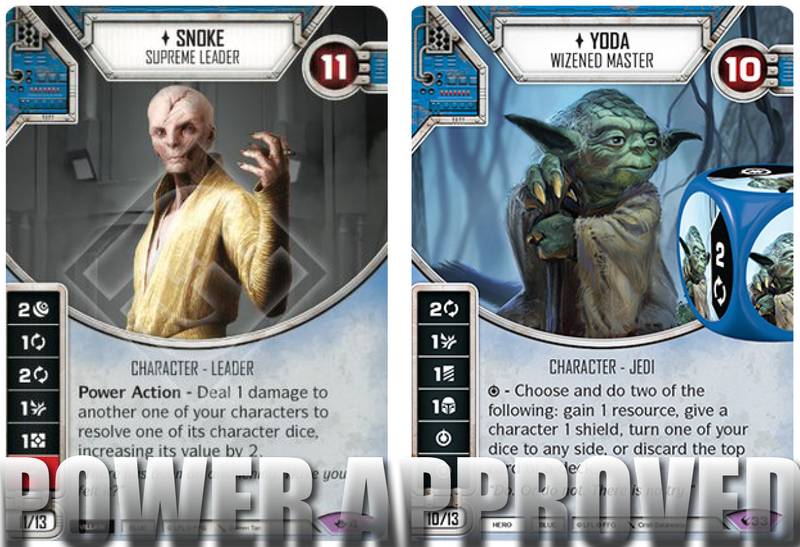 [EDIT // AUTHOR'S NOTE: Obviously those predictions only applied to the period of time in between release and Snoke errata, it's not reasonable or really even possible to make predictions based on unknown balance changes in articles like these // EDIT]. Additionally these predictions only apply to this current standard meta, and any new set releases or Balance of The Force changes null these predictions (at the time of writing Theed Royal Palace has already been nerfed, and the new Holocrons as well as Rules Reference 1.9 is already taken into account). ... JUST ISN'T THAT GREAT! She might, might, be playable but only as filler. She really isn’t all that special. For the life of me I can’t understand why people get excited about her. Her best claim to fame is that she has an acceptable, not great, but acceptable die side that can be turned elite for just 10 points, which is important because she is only marginally better than Rebel Engineer if she is not elite. In fact, she is close enough to Rebel Engineer when non elite that she is in danger of losing the slot for the better filler red character, assuming of course that we are talking about a vehicle deck. Let’s be clear though, Satine’s only home will be in a vehicle deck. That’s only going to be if the right kind of list can even exist, which honestly I doubt for someone like Satine. I think Hero Vehicle lists that swarm vehicles are dead, and it's going to be Voltron style Shadowcaster decks or nothing for them. 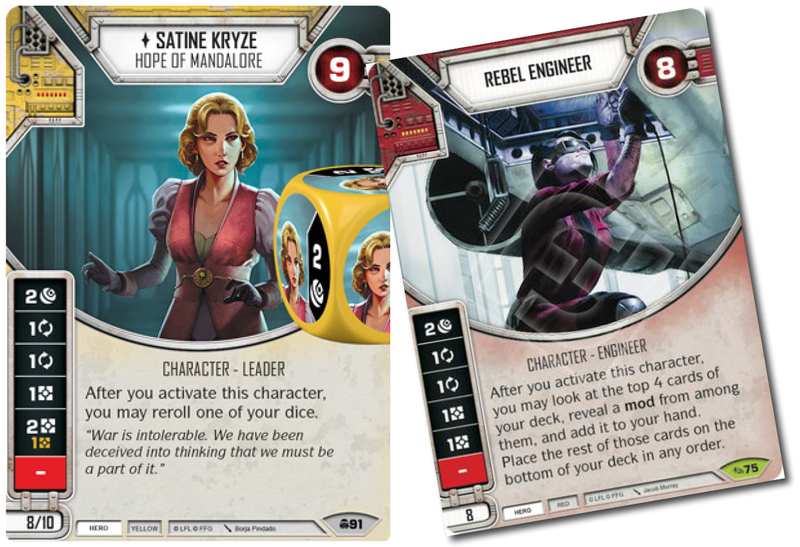 Unfortunately for Satine, L3-37 is a far superior character for lists like that, and Rebel Engineer will definitely edge her out in the points race. Look, I know many people wanted a good Mace Windu, given the last one was essentially unplayable. And it really looks like we are going to have to wait a bit longer on that one! 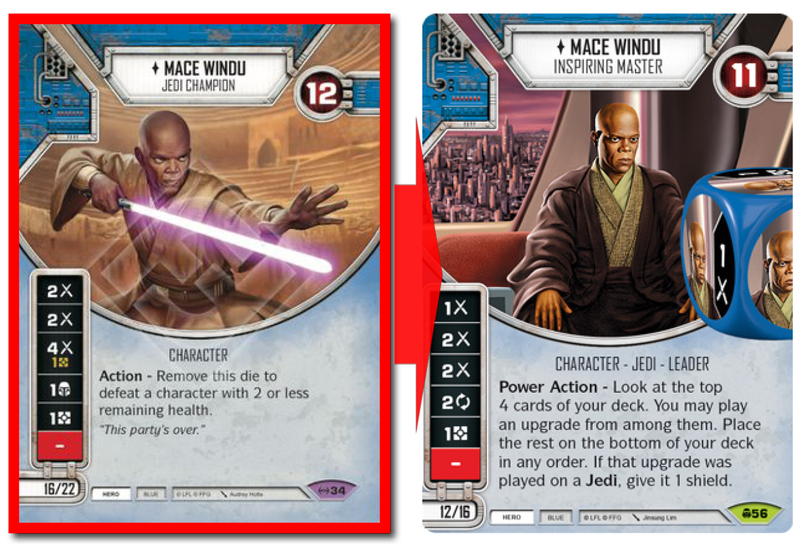 Mace Windu's problems are three-fold: First off, blue is not as great as it used to be. Mace isn't going to get bonus points just for letting you play cards like Force Illusion. Secondly, all the good blue upgrades left! What is he going to grab? Comparatively mediocre upgrades compared to Ancient Lightsaber and Force Speed? Sure it has SOME value (unless you miss, in which case he is definitely mediocre for that round), but it’s not GREAT value. If you are playing competitive, you don’t want decent value, you want great value. Which leads us to the third problem: Luke Skywalker - Reluctant Instructor is still here. Not only is Luke3 better than Mace2, but Luke3 is already pretty middling in terms of playability. Ironically Mace’s best partner might end up being Luke3, but that sounds pretty Tier 2 to me. Sorry Mace "... you are on the council, but we do not recognize you as a Master". ... IS DECENT - NOT AMAZING! Everyone is foaming at the mouth over this card, and I think everyone needs to dial it back a little. Sure, it’s not hard to play with a Leader (it’s actually pretty easy to be honest), and sure rolling 3 dice is pretty good. But have you actually looked at the die sides you are going to be trying to resolve though? Megablaster Troopers itself has 2 Blanks, and a 1 Ranged which if you have read enough of my material you will know I consider to basically be a Blank for a high costed card. 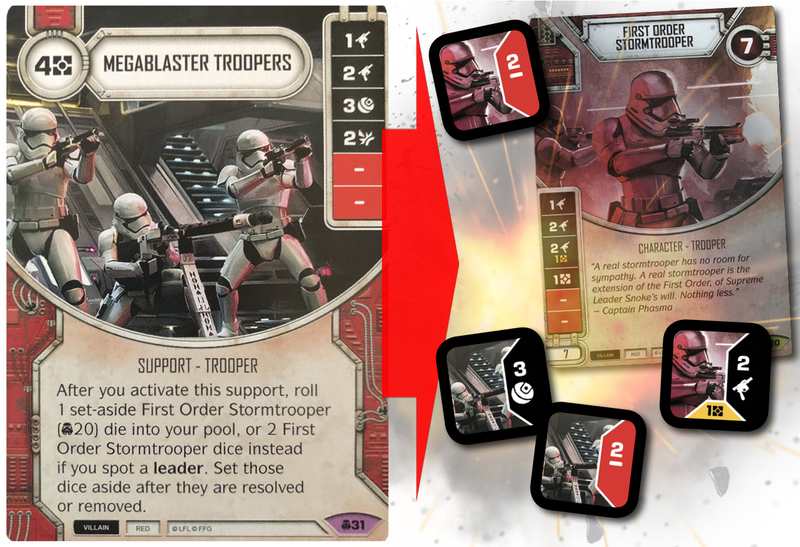 I won’t condemn the troopers single ranged sides as the effect of Megablaster’s ability in relation to its cost dictates that if you are going to add 2 additional dice to the pool, they can’t be too strong. That’s not to say they are incredible, but they are passable for what they are. 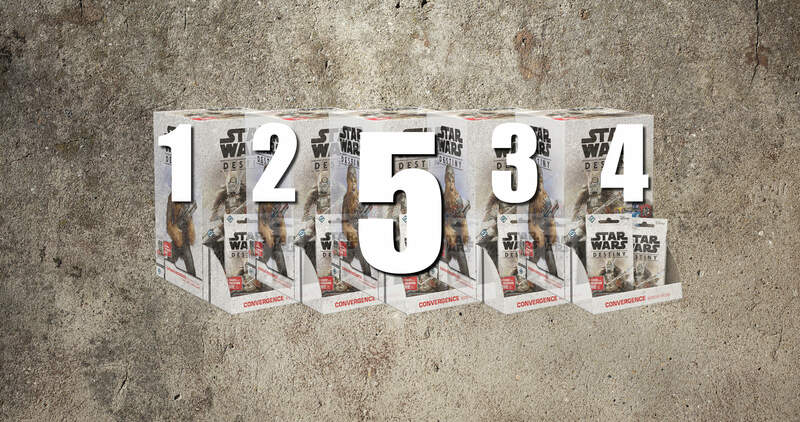 The First Order Stormtrooper dice also have 2 Blanks, and a pay ranged 2 side which will also be a Blank more than you are going to want it to be. Between the 3 dice, and I do hope its 3, you probably shouldn’t play this if its only 2, you are going to have many moments where you are struggling to find resolvable die sides. Even when you do find resolvable die sides, at what point is the card really worth it? Each dice showing 1 Ranged feels miserable. Even a 2 Ranged damage and two 1’s is going to be pretty bad. The real value only occurs when Megablaster is hitting its 2 Ranged and 3 Indirect (1/3 rd chance), and the Troopers are hitting either the 2 Ranged side or the Resource side (1/3 chance). The 2 Ranged for 1 resource side can be fine occasionally, but that’s only ups it to a 50% chance. Those are pretty bad odds. If you can’t resolve some decent Focus sides this card has a lot of potential to drag down your actions and hand size with rerolls. Megablaster Troopers is a high ceiling low floor card, which is not the mark of an “amazing” card. 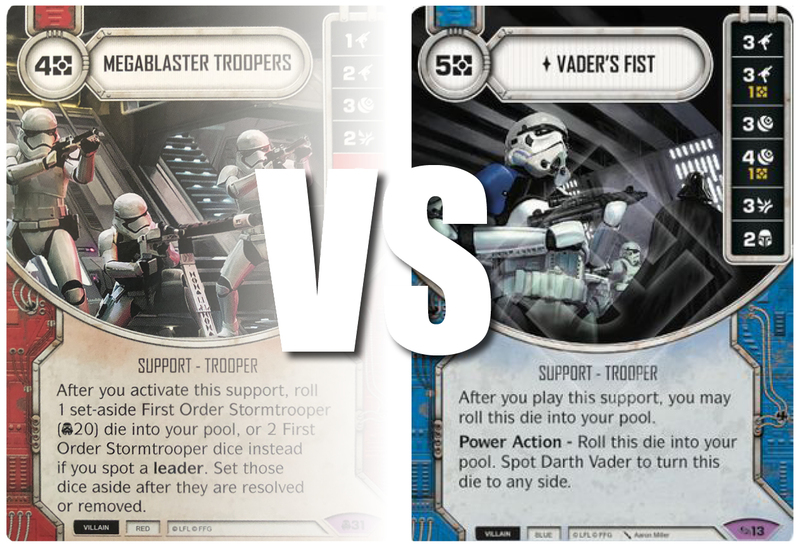 Vader’s Fist, now that is an amazing card! It doesn’t have a low floor. Vader’s Fist is high ceiling high floor. To be clear, Megablaster Troopers is still going to be quite playable, it’s just not insane like everyone thinks it is. ... HAS BEEN DETHRONED, YELLOW IS IN CHARGE! Blue only has Snoke and Yoda left, who admittedly are good enough to ensure that Blue continues to see plenty of play. Mother Talzin just lost 2 sets worth of odd costed cards, Force Speed is out, Force Illusion is gone, Ancient Lightsaber is MIA, and Sith Holocron has gone the way of the Dodo. There are playable left, but I think we are going to be playing Blue just for the characters at this point. It doesn’t help that mono Blue Heroes is looking to be unplayable again in a world of supports. Red is definitely on the up and up but Yellow has a solid head start on it. Yellow is going to have some of the best removal, tricks, and even die cards now. ... WILL BE MORE IMPORTANT THAN ROLLING WELL! Last meta was pretty brutal, most of the tier 1 decks were so powerful that they were nearly loss proof if they had some combination of decent to good draws and rolls. 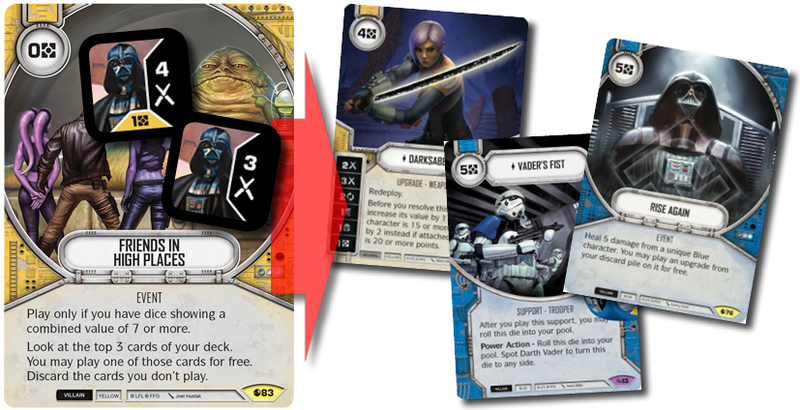 We all played games where you played perfectly then a Vader3 slapped you for 500 damage because you whiffed on drawing removal. Or maybe someone Friends in High Places into a Vader’s Fist turn 1 and hit you for 9 ranged damage. What about those Cassian/Jyn’s that deleted your primary character round 1? I think that might happen some, but at a far lesser rate than it used to. Vader3, the king of #$%#$%@% variance, lost many of his best toys: Force Illusion, Friends in High Places, The Price of Failure, Rise Again are all gone. He can still play a turn 1 Vader’s Fist, but honestly if he doesn’t do that he’s probably heading back to tier 1.5-2. Vader losing his face roll prowess alone will significantly re-enable outplaying your opponents to be a key factor in winning again. Theed Royal Palace got nerfed too. Less games are going to be decided by who won the die roll, and there will actually be a point to taking Shields again. 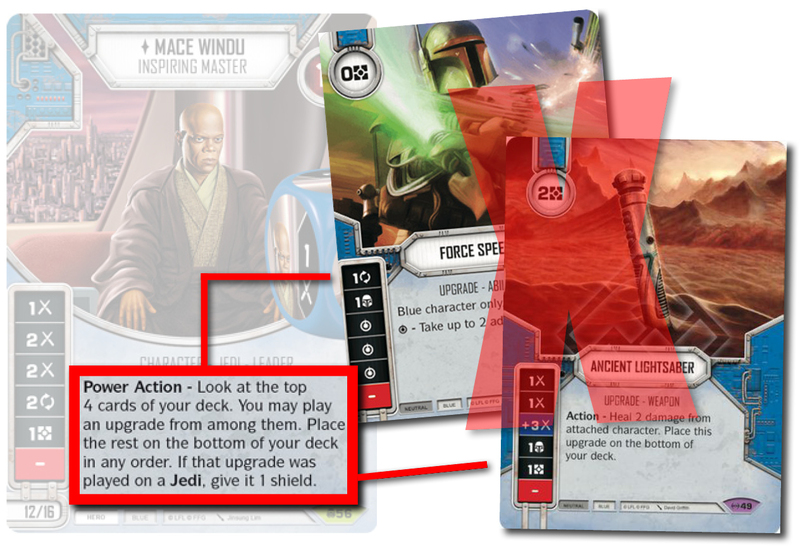 Massive ramp cards like Chance Cube, Sith Holocron, and Rally Aid are also gone. Board states will be less “oh nice you had ramp card X and payoff card Y in your hand turn 1, GG” and more about meaningful linear progression rather than 2 card combos. Second Chance is now safely stored away in our binders! Not only will you be able to kill characters again, your opponents can't just draw one card to save a character that was dead to rights and hanging on by a thread. I could keep going, but I really think high level players will start to feel like their decisions will start to be meaningful again, not just a small edges that will lose handedly to an average roll/draw.